Get this exclusive Adult Deluxe Vanellope Von Schweetz Costume from the movie Wreck It Ralph and become the arcade game character that defies the odds! This Child Deluxe Vanellope Von Schweetz Costume from the movie Wreck it Ralph is officially licensed and available exclusively here. Normally, people don't get medals for destroying stuff, but even guys who break stuff like to play the hero! 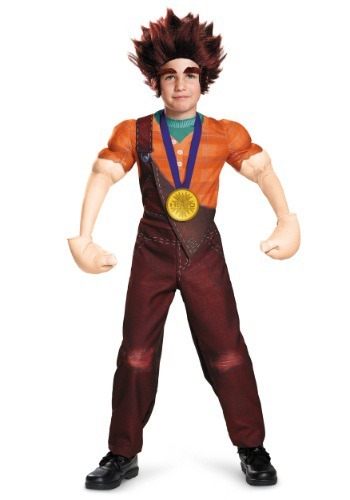 If you kid is good at wrecking stuff, but still wants to be a good guy, then he should try this Child Deluxe Wreck It Ralph Costume on for size. It brings the Disney characters video game good looks and wrecking style to real life. That means your kid can smash it up, while looking great and becoming the hero. Even Fix-It Felix can't do all of those things. To wreck it, or not to wreck it? That is the question. 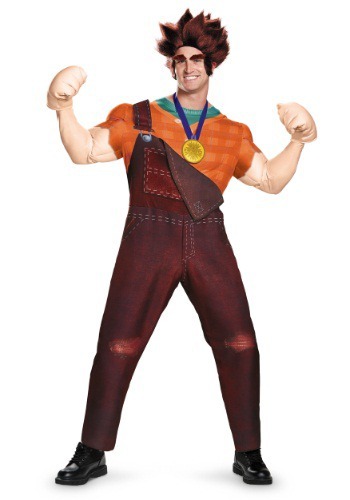 We say, if it makes for a good arcade game and you plan on wearing this Plus Size Deluxe Wreck It Ralph Costume while you do it, then you should go for it! It comes from the Disney animated film and it may just have you in mood for winning some medals. We suggest you try winning costume contests, because winning one in Hero's Duty seems like a huge mess!